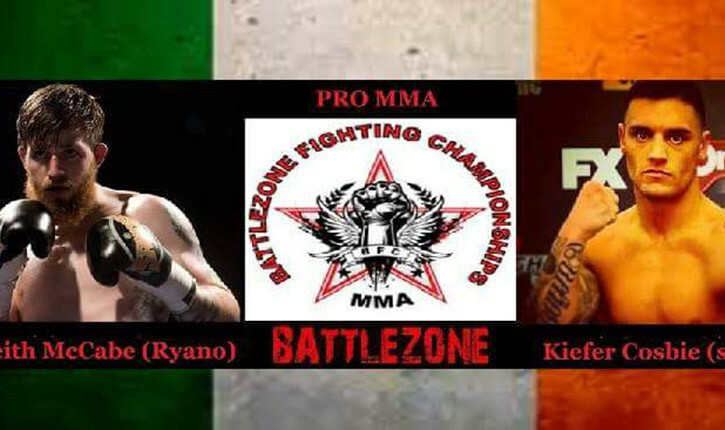 We spoke with “The Butcher” Keith Mcabe who makes his pro mma debut at Battle Zone 15 on April 2nd. McCabe who had alot of success in the amateurs, holding the Akuma title before finally making his move to the professional ranks. Alongside a number of fights under the K1 banner. Now looks to carry on where he left off and make an immediate impact as a pro. You moved clubs in the not too distant past. How have things been since the change? Yeah I made the change to Team Ryano about 6 months ago. Things have been great, great atmosphere , great training and great coaching. It has been a real eye opener to the hard work, dedication and commitment needed in order to make it to the top level and I believe having the training partners I have in Team Ryano and the coaching of Andy Ryan I will get there. You took some time off from active competition. Do you feel it benefited you and if so in what way? Yeah it’s been a year since my last mma fight , I never stopped training, I went around to a couple of Thai gyms to spar and mix things up and ended up having a few K1 fights, mainly to improve my stand up and get more experience. So my next step was to make the move to Team Ryano. What changes have you seen in your own development in recent months? How does The Butcher 2016 differ from the same fighter in 2015? What would you say are the biggest changes? In the short 6 months I have been there I can’t believe how much I have evolved my game already. When you are training with top professionals such as Paul Redmond, Neil seery, Myles Price, Patrick Wixted, Ayo daly and Jonny Jits just to name a few and not to mention all the talented up and coming amateur fighters , there would be something wrong if you didn’t improve. So you will see a bigger, better, more improved, well rounded fighter on April 2nd on Battle Zone fighting championship. This is your first professional fight in mma? The amateur scene is at such a high level in Ireland. Are you expecting much of a difference between the two? Yeah the Irish amateur level is amongst the best in the world but I think the move to pro is still a big one, with the smaller gloves, elbows and longer rounds. Honestly I’ve been dreaming of this moment since I started training mma and there is no better club than Team Ryano when it comes down to turning pro. I’ve been training just over 4 years now, I’ve trained hard and I’ve been committed to the sport since day one, nothing is going to stand in my way. You are facing Kiefer Crosbie at welterweight Battlezone 15. Kiefer is just coming off win at Ryoshin FC 9? You have beaten him before? What if anything will be different about this time around? I see the fight going the same way it did the last time we fought, with my hand raised at the end . BAMMA are doing their thing in Ireland as well as Cage Warriors making a return. Can you lay out your plans for the next year or so as a pro or at least where you want to be, come NYE 2017? It is great to have such big shows in Ireland like Bamma, the return of Cage Warriors is also great, but I’d hope to get on the next Bamma show when it is back in Dublin, but Andy Ryan is the boss so what ever he says, goes. I want to say a huge thanks to Andy Ryan and all the lads down in Team Ryano. Big thank you to Kevin Hendrick of Strength Performance Institute , Vini Cardoso of Mohawk Fight Wear and Classic Cabs for their much appreciated sponsorship and to all my friends and family for all the support the give me.